Bozteck VENM Console includes a powerful remote screen capturing feature. This feature does not require that VNC or any other remote screen sharing software be installed in order to work. There are a few system requirements on the remote computer end, however. Because of these requirements, it is “best practice” to use this feature on computers that are on your LAN or within reach of your VPN. For security reasons, it is not advisable to use this feature over the open Internet. You can supply the Administrator level access required to make this feature work in either the main VNCScan preferences, the group properties, or the computer properties. The choice depends upon the scope that you wish to apply. Adjustable Interval – You can adjust the interval using a dropdown box of predefined timings or type in your own number. The intervals are measured in minutes. You can enter a decimal number to take snapshots in times less than one minute. If you manually enter a timing, it is applied when you press . Archive Screen Captures – You can archive your screen captures for later viewing. The location of these archives can be changed by clicking on the “Folders” button on the toolbar. 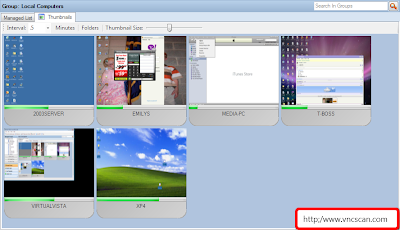 Connect to VNC – You can connect to VNC right from the thumbnail. The connection options are taken from the computer entry settings in VNCScan. The “Please Wait Screen” – This screen is the start image for a new screen capture session. It is normal for it to still be visible even after the progress bar has cycled a couple of times. If it is still the only image being displayed for a computer even after the progress bar has cycled more than three times, you may want to check the permissions settings for the computer. You can test this out by attempting to access the c$ share of the remote computer. You can do this by clicking on your Start button and choosing “Run”. In the textbox, type \c$ (where is the name or IP address of the remote computer). Black Screen Capture – This is shown if the remote computer is sitting at the login screen and nobody is logged into the computer. This entry was posted in how-to and tagged Capture, Remote, Screen, Stealth, Thumbnails. Bookmark the permalink.